Located off Solon Rd just South of Chagrin River Rd., Quarry Rock Picnic Area offers beautiful views of the Chagrin River including the peaceful sounds of waterfalls nearby. The area offers picnic tables and grills for a beautiful, scenic picnic. Other features are decks for viewing the river and a restroom facility. 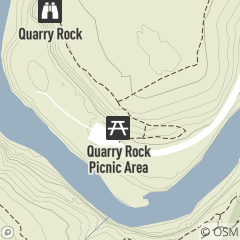 Quarry Rock Picnic Area is located off Solon Road in South Chagrin Reservation, south of Chagrin River Road in Bentleyville.